For All Your Airflow Needs! All AirFlo Cooling Technologies louvers use a bolted connection between the blade horn and the actuator rod. Heavy duty spring loaded manual operator will provide years of service. Engineering and trained customer service professionals assure order accuracy and that Airflo louvers comply with all applicable industry specifications. Welded aluminum side frame construction offers AirFlo Cooling Technologies customers the choices to match assembly methods to their needs for a wide variety of applications. 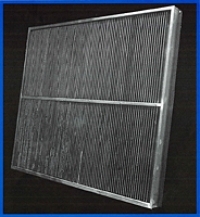 Optional deep frame louvers allow clearance for all operating mechanisms and enclose the blades to ensure that screens or covers will not interfere with the opening and closing of the louver blades. 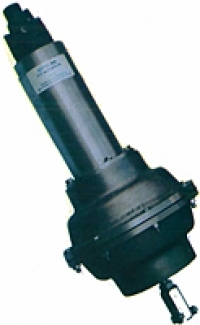 Unique blade pin bushing design prevents rotation of the bushing in the frame, eliminating wear between the bushing and the frame. The 3000 Watt Laser Cutter allows customization of louvers to meet your needs without the time and expense of dedicated tooling and dies. Linkages use a clamp type connection to the torque tube for both 1 inch steel pipe and 2 inch aluminum style torque tubes. This rugged actuator was specifically designed for operating louvers when mounted in either vertical or horizontal orientations. 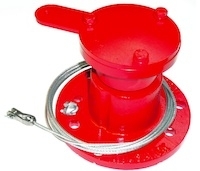 The Series 800 actuator is manufactured with no brass or copper components which are prohibited in some process applications. 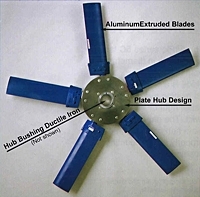 High efficiency and low resistance eliminator blades available either as loose blades with holders and spacers or completely framed as assembled modules. As a result of our product research the accurately roll formed blade has proven successful in all types industrial applications. We offer two blade profiles available in galvanized or stainless steel, 4-B (four bend) blade for light duty moisture removal encountered in the downstream of cooling coil banks. 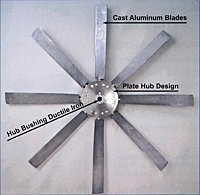 6B (six bend) blade used where heavy moisture loads are encountered in spray scrubbers and air washers. Frames can be fabricated out of galvanized, stainless, or carbon steel also painted to specification. A carefully constructed state-of-the-art test facility delivers fast and accurate performance measurements for a wide variety of fans and related equipment. The AMCA compliant cell and computerized data acquisition deliver repeatable results which are more accurate than test cells that measure airflow at the fan. AirFlo Cooling Technologies ability to test larger fans means that data scaled from model tests can be verified by full size fan tests to ensure accuracy of performance modeling algorithms. For over 25 years AirFlo Cooling Technologies 12F Series fan has been an industry workhorse known for reliable performance, service life and durability. This time tested performer is enhanced and improved by the benefits of modern fabrication technology to provide a fan with greater durability and consistency. The AirFlo series 7E fan is available in diameters from 3.5' thru 8'. The blade is a 7" wide aluminum extrusion with a symetrical air foil (making it reversible). and traceable to the National Institute of Standards and Technology.